Team photo with students, mentors, family and friends with the Imagery Award trophy taken after the presentation at the 2018 Milwaukee Regional Competition. We were also runners up and received a wild card entry to the World finals in Detroit in April. Fond du Lac, Wis. – April 11, 2016 – The Fondy Fire Robotics team has advanced to the FIRST® Robotics Championship. This annual event features 600 teams from around the world and will take place at the Edward Jones Dome in St. Louis, Mo., April 27 – 30. The team recently participated in the Minnesota North Star Regional competition on the campus of the University of Minnesota-Twin Cities where they earned the Engineering Inspiration Award, providing the team with an automatic entry into the Championship. The award recognizes outstanding success in advancing respect and appreciation for engineering within a team’s school and community. During the two-day competition, Fondy Fire Team 2194 along with alliance captains Wave Robotics Team 2826 from Oshkosh, Wis., and alliance partners RoboHuskie Team 2574 from St. Anthony Village, Minn., also earned the Finalist Award by taking second place in the competition that featured 60 teams from the upper Midwest. This year’s FIRST Robotics Competition, known as FIRST Stronghold, features two alliances of three robots each on a quest to breach their opponents’ fortifications, weaken their tower with boulders, and capture the opposing tower. It is a game where a medieval theme meets hightech competition. The North Star Regional judges showed a great deal of interest in Fondy Fire’s robot design. Ethan Weber, a senior from New Holstein High School, added, “we worked extremely hard on the design of our robot and it features some amazing technology. I’m very grateful that the judges recognized the advancements that we have been able to achieve.” This fall, Weber will be attending either the Massachusetts Institute of Technology (MIT) or Stanford University, and is the drive team leader for Fondy Fire. For more information about Fondy Fire Robotics, please visit fondyfire.com. 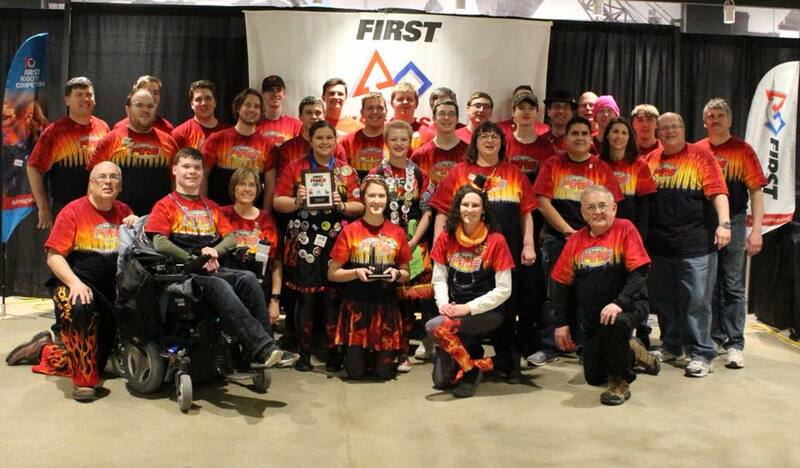 FIRST® Robotics Team 2194 Fondy Fire is based in Fond du Lac, Wis. and is dedicated to promoting STEM education and experiences for students in the region. Participants include students from many area high schools, including Fond du Lac High School, New Holstein High School, Kiel High School, Laconia High School, Mayville High School and Winnebago Lutheran Academy. The team was started in 2007 and is celebrating its tenth year of competitions in 2016. Fondy Fire meets at Moraine Park Technical College in Fond du Lac. Fondy Fire Robotics is proudly sponsored by John Deere, Moraine Park Technical College, Belke Financial Group, PTC, BCI Burke Company, Mayville Engineering Company (MEC), Du Fu Engineering LLC, Industrial Controls Engineering, Inc., RB Royal Manufacturing, Fond du Lac School District, Milwaukee School of Engineering, Spiros Industries, Mid-States Aluminum, JF Ahern, Chicago Tube & Iron, HUI Manufacturing, Saputo Cheese, Hansen Refrigeration, Holiday Automotive and Mercury Marine. For more information about joining the team or becoming a sponsor, please visit fondyfire.com. FIRST® (For Inspiration and Recognition of Science and Technology) was founded in 1989 by inventor Dean Kamen to inspire young people’s interest and participation in science and technology. Based in Manchester, N.H., the 501(c)(3) not-for-profit public charity inspires young people to be science and technology leaders, by engaging them in exciting Mentor-based programs that build science, technology, math, and engineering (STEM) skills, that inspire innovation, and that foster well-rounded life capabilities including self-confidence, communication, and leadership. FIRST® provides a progression of four global, after-school programs for K-12: the FIRST® Robotics Competition for Grades 9-12 (ages 14 to 18); the FIRST® Tech Challenge for Grades 7-12 (ages 12 to 18); the FIRST® Lego® League for Grades 4-8 (ages 9 to 16; ages vary by country); and the FIRST® Lego® League Jr. for Grades K-3 (ages 6 to 9). FIRST® also operates a research, development, and training facility called FIRST® Place™ at its headquarters in New Hampshire.